Here are some snazzy birthday facts about 2nd of June 1938 that no one tells you about. Don’t wait a minute longer and jump in using the content links below. Average read time of 10 minutes. Enjoy! What day was my birthday Jun 2, 1938? June 2, 1938 was a Thursday and it was the 153rd day of the year 1938. It was the 22nd Thursday of that year. The next time you can reuse your old 1938 calendar will be in 2022. Both calendars will be exactly the same! This is assuming you are not interested in the dates for Easter and other irregular holidays that are based on a lunisolar calendar. What day is June 2 this year? 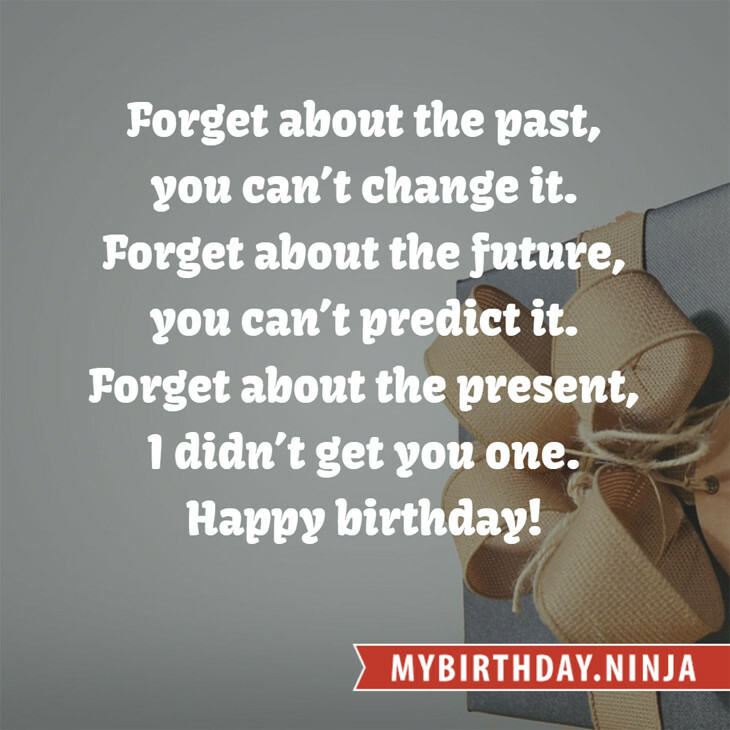 There are 42 days left before your next birthday. You will be 81 years old when that day comes. There have been 29,543 days from the day you were born up to today. If you’ve been sleeping 8 hours daily since birth, then you have slept a total of 9,848 days or 26.96 years. You spent 33% of your life sleeping. Since night and day always follow each other, there were precisely 1,001 full moons after you were born up to this day. How many of them did you see? The next full moon that you can see will be on May 18 at 21:13:00 GMT – Saturday. Fun stat: Your first one billion seconds (1,000,000,000) happened sometime on February 8, 1970. If a dog named Kero - a Irish Wolfhound breed, was born on the same date as you then it will be 415 dog years old today. A dog’s first human year is equal to 15 dog years. Dogs age differently depending on breed and size. When you reach the age of 6 Kero will be 45 dog years old. From that point forward a large-sized dog like Kero will age 5-6 dog years for every human year. View the complete list of June 2 celebrity birthdays. Who are the famous June 2 birthdays? Here’s a short list of famous people in history who were born on Jun 2. View the complete list of June 2 famous birthdays. What happened on my birthday – Jun 2nd? Franco-Dutch War: France ensured the supremacy of its naval fleet for the remainder of the war with its victory in the Battle of Palermo. Intolerable Acts: The Quartering Act is enacted, allowing a governor in colonial America to house British soldiers in uninhabited houses, outhouses, barns, or other buildings if suitable quarters are not provided. French Revolution: François Hanriot, leader of the Parisian National Guard, arrests 22 Girondists selected by Jean-Paul Marat, setting the stage for the Reign of Terror. Guglielmo Marconi applies for a patent for his newest invention, the radio. World War II: German paratroopers murder Greek civilians in the village of Kondomari. The coronation of Queen Elizabeth II, who is crowned Queen of the United Kingdom, Canada, Australia, New Zealand and Her Other Realms and Territories & Head of the Commonwealth, the first major international event to be televised. In Denver, Timothy McVeigh is convicted on 15 counts of murder and conspiracy for his role in the 1995 bombing of the Alfred P. Murrah Federal Building in Oklahoma City. He was executed four years later. View the complete list of June 2 historical events. What does my birthday June 2, 1938 mean? Your birthday numbers 6, 2, and 1938 reveal that your Life Path number is 11. It is a master number that represents intuition, idealism and invention. You have the potential to be a source of inspiration and illumination for people. The following celebrities also have the same life path number: Joe Cornish, Robin Hunicke, Dion DiMucci, Andrew Divoff, Chris Squire, Cathy Moriarty, Amanda Seyfried, Michael Jordan, Emily Tyndall, Jenna Ushkowitz. 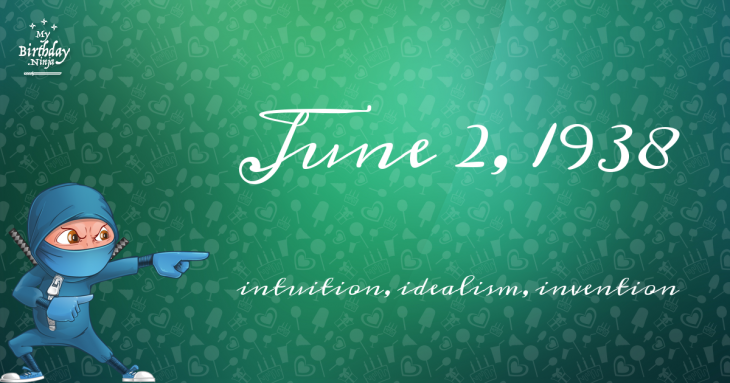 What is the birthday horoscope for Jun 2, 1938? The Western zodiac or sun sign of a person born on June 2 is Gemini ♊ (The Twins) – a mutable sign with Air as Western element. The ruling planet is Mercury – the planet of communication. According to the ancient art of Chinese astrology (or Eastern zodiac), Tiger is the mythical animal and Earth is the Eastern element of a person born on June 2, 1938. What is the birthstone for June 2? Fun fact: The birth flower for 2nd June 1938 is Rose for devotion. What is the Love Match for Jun 2, 1938? When it comes to love and relationship, you are most compatible with a person born on February 16, 1933. You have a Love Match compatibility score of +110. Imagine being in love with your soul mate. On the negative side, you are most incompatible with a person born on December 19, 1951. Your incompatibility score is -94. You’ll be like a cat and a dog on a love-hate relationship. Arf-arf, I want to bite you. Meow-meow, stay away from me! What is a good birthday trivia for June 2? I do not know how you feel about this, but you were a female ♀ in your last earthly incarnation. You were born somewhere around the territory of Israel approximately on 1675. Your profession was seaman, cook, carpenter. What is the popular baby name on 2 Jun 1938? What’s your bizarre Florida Man story? The #FloridaManChallenge is breaking the Internet and social media. Some crazy men, women, or creatures from the Sunshine State are making headlines every day of the year including your birthday. Try this fun exercise. Pick your search engine of choice and type in “florida man June 2” and see what kind of wild news headline you will get. This viral craze started in 2013 and gets resurrected now and then. The latest was from Tumblr and found its way to Twitter. As they say, the rest is history. Here’s a quick list of all the fun birthday facts about June 2, 1938. Celebrities, famous birthdays, historical events, and past life were excluded. Try another birth date of someone you know or try the birthday of these celebrities: October 22, 1969 – Helmut Lotti, Belgian singer-songwriter; January 3, 1946 – Cissy King, American singer and dancer; February 5, 1963 – Steven Shainberg, American director, producer, and screenwriter.